I Want to leave some kind of essay about the event, which, though it may at first glance, and is the same as many, but is new. This is probably the main feature. Besides, the event was generated by the thought and materialized during the month. See «oppozit gods» favored and everything came together, though not all may, passed and smoothly, but all the organizational problems have been resolved and who of them had not remained indifferent, according to my observations. Winter biker event in St. Petersburg held not often, or rather not when really was. Hence, I need to go! But the question arose: «what?». It is clear that we need to go on a motorcycle, but when not on the move, this is quite problematic. Besides, it's all the same area. Further, in principle, no options or the most reliable transport оппозитчика is a train and a variant of route taxis. Option bus seemed to me to be preferable. On the eve of the 17th Packed his bag with warm things and the next day I went with Luggage to work. After work immediately on the subway to the find me a minibus. I would like to certain lyrical digression, as seen me somewhat puzzled. At the end station there were a bunch of people, just what the sale and all bursting. Queue on the bus started almost from the door and then through the underground pedestrian crossing. Queue in suburban cash trains so, but were not so numerous. Then came out the picture of «oil». The area is crammed with people and revealed to be Smoking Chinese small buses. From the exhaust breathe not than who breathes through the scarf, who through time. Just a picture of some industrial disaster and people evacuated from the city. Square build another new building and who will go there to live is not clear. Don't even know they were in luck or not me, but my bus just left and I was the first in the queue behind me quickly lined wish. These people are clearly rode rest in a sanatorium and returned to their homes after work. This was something that if every time have to get to work and back. The bus was Packed to failure, so sitting in the aisle on his knees put their packages, bags standing in the aisle. And that all these people makes twice a day so on themselves and others scoff? Animal desire to eat and consume? Perhaps it's easier to learn to eat less and consume? These questions concern to me on the way to the sports facilities them. Lesgaft. Now they are telling me that my stop and I get out of the bus. Forest, highway, there is no light and only retreating dimensions of the bus. My first thought was, and if I went out there :). The internal dialogue telephone stopped biker Wasilich, with questions about my intention today to come. Told him that type in place of, well, almost, where to go short do not know. Prompted where to go, so I went. He went to a meeting me on the sidecar and picked me up. At the entrance bought a ticket and I went for registration, for settling in a room. We must probably say about the rates. The entrance ticket of category M - 500 RUB. 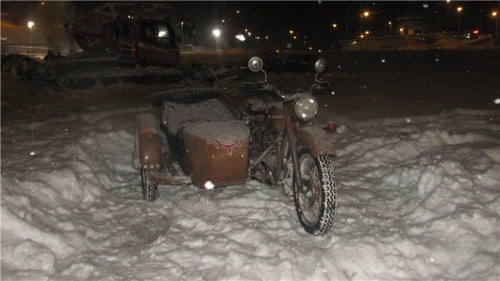 Participants on motorcycles Ural made only contribution to the prize Fund of 500 RUB. This generally pleased with it, because all budget or almost for free. At the entrance to the ticket, accompanied by a set of Souvenirs (icon, keychain, magnet) regardless of which category ticket. For those wishing were rooms in the hotel, simply chic for 2000 rubles per day. Prizes were not only monetary but also valuable in the form of hours. In General, the organizers tried to award all since may that the participants were not many. But it was a lot of prizes. Were not limited to the traditional grease chain, a mug and t-shirt. Participants of the prizes from the scene carry the packages. Shorter really can come from far and didn't spend money. Or just roll on the weekend, and with a bunch of prizes and money raising. So, everything was on the highest level. Come guys with GoldWing club began to drink all comers viskarem and recommend to visit the sauna, as it is excellent. Their advice and followed. After water procedures went again into the street miss a couple of cups of tea, enjoy views of nature and get the sleep and appetite better. Morning in the hotel was a slaughterhouse for Breakfast. Went into the dining room boarding house, at this time, Breakfast, young athletes. In the employee dining room decided to ask where we could pay for Breakfast. What we all traditions of Soviet dining room гаркнули that Breakfast was yesterday ordered, and as it became clear that we like ain't welcome here, and we retired smoke the whole thing. After the second attempt to find out from the administrator where we have Breakfast. We were advised to be with them on stricter and then we can get Breakfast in the morning, why, well, in General, not hungry and well. On the street all boil. Drove cars with trailers and unloaded the bikes. It became clear that we write not alone. For musicians were brought up to gas heat gun and they seem ready to play. Went to check on the rally. Start time moved from a planned, as the participants arrived and with the motorway were not quite difficulties. Because the administration are strictly on a strictly prohibited to throw the ski track athletes, and athletes themselves on the track were many who would not knock. The track is prepared divided for different classes of members. The presenter invites all participants to start to support the participants. Arrival of the three circles of the time with a pause between the start of the participants. First, ATVs, motorcycles and sidecars. kotik-bratik started crews with two children. - motorcycles drew a tow rope. Attended two of the Urals 650 and modern Patrol 750. Good old motor 650 not right straight up, burning rubber on asphalt and pulled boiling cauldrons. At the end noticed drops of aluminium pots in the heat. - Who competed more people take quadrics or Dnepr kotik-bratik'and. Needless to say, kotik-bratik won having dragged off 16 people against 12 ATV. Я рад, что недостаточно хорошо знаю английский, иначе бы многократно разбил лицо ладонью, читая сие. а зачем наоборот то переводить? 1. "Блог — это почти дневник. Каждый оппозитчик может создавать и вести свой блог." Писалось не для размещения на "Главной", а именно в блог. 2. Мои финские и немецкие друзья очень плохо умеют читать по-русски. В основном для них и был сделан этот перевод и выложен в блог. 3. Я посчитал, что будет неплохо иметь возможность давать ссылку на оппозит, при общении на забугорных форумах. Не только нам по их форумам шастать, но и надо суда подтягивать. свежий иностранный обзор инжекторного урала.